The Trader family lived at Third and King Streets in Xenia when James Frank Trader has business interests In Yellow Springs. He and his wife had four daughters Effie, born in 1874, Georgia, 1876, Florence 1878 and Louise in 1885. Georgia was born with imperfect eyesight. Following an eye operation when she was just seven years of age, she developed an infection which caused her to lose her sight in both eyes. In 1887, the family moved to Cincinnati and soon Mrs. Trader made arrangements to transport her daughter to Columbus to attend the State School for the Blind. After Mrs. Trader arrived at the destination with Georgia and Florence accompanying her, she decided that she could not leave her daughter to be cared for by strangers. Instead, she decided that she could teach Georgia herself and so the two girls and their mother took the train back to Cincinnati. Florence and Georgia were very close when growing up and upon their return to Cincinnati she determined that she too, could help Georgia. It was agreed that the two girls would attend school together with Florence’s help. They attended the Avondale Public School at first and then during their high school years attended Miss Armstrong’s private school. Georgia adapted very well to her circumstances and Florence was a great help to her sister, reading to her and encouraging her to learn braille. Georgia felt strongly that others in her predicament should have similar benefits. She persuaded the head librarian at the Cincinnati Public Library to provide an area in the library where some books for the blind could be kept. The Librarian was pleased with the idea, but budgets being what they can be, suggested that the girls raise funds for the purchase of braille books. They felt very strongly about their mission to help others who were visually handicapped and so sought the assistance of William A. Proctor of the Proctor and Gamble Company. Fortunately Mr. Proctor liked the idea and helped raise the funds for the library section. With his assistance, Florence and Georgia were able to establish a Cincinnati Library Society for the Blind in 1901. Following Mr. Proctor’s lead, many prominent Cincinnati businessmen donated books for the shelves. Some residents agreed to go to the library to read to those who were unable to read the printed words and could not read braille. Georgia and Florence even arranged transportation to and from the library for the blind and then arranged for books to be loaned at home for those who were unable to visit the library. Georgia began teaching others how to read and write while Florence undertook classes to teach games of cards along with other necessary skills such as how to thread a needle or tell time. Two other sisters may have been instrumental in establishing what became the Clovernook Home and School for the Blind, though it is likely the two sets of sisters never met. Alice and Phoebe Cary grew up in Cincinnati, but moved to New York. They were poets who enjoyed a certain amount of fame. When the Cary land became available, Mr. Proctor deeded the twenty-six acre site along with Cary Cottage in order for Georgia and Florence to realize their dream of a home for those who were sightless. The Clovernook Home and School for the Blind opened in 1903 with three residents. The building was small and after a few years no longer usable for its intended purpose. By 1912, there were thirteen residents. After ten years a new building was constructed next door and dedicated on May 6, 1913. The original Cary Cottage is listed on the National Register. It was maintained under the direction of the Women’s Cooperative Board of Clovernook Home and School. One room was dedicated to the founders and is known as the Trader room. Featured are displays of family mementoes, photos and some items which previously belonged to Georgia and Florence, along with photos of Mr. Proctor. The Home continued to grow and offer trades for those who could not see. One of the first pieces of equipment was a weaving loom. The residents quickly learned the art of weaving which provided income for the residents and the school as well. In 1922, printing equipment was donated. This became the second largest printer of books for the blind in the country. As the years passed, additional buildings were added including a four-bed hospital in 1920 and in 1926 a $50,000 addition to the main building which was financed by public subscriptions. Special events were held at the home to meet operational expenses. In 1944, he Trader sisters were honored by Helen Keller for their service to those with special needs. Sadly, Georgia died that same year, but Florence continued for several years serving as a trustee of Clovernook and secretary-treasurer of the Cincinnati Library for the Blind. The library continued to provide the loan of a variety of materials, both braille and large print publications along with audio books. The dedication of two Xenia girls proved to be beneficial for many individuals who suffer from loss of sight. At a time when there were few options for the sightless, they saw only a bright future for those who needed specialized help. In spite of Georgia’s handicap, she was able to help others in similar circumstances. She and her sister provided necessary assistance when previously none had been available. Today the institution is known as the Clovernook School for the Blind and Visually Impaired. 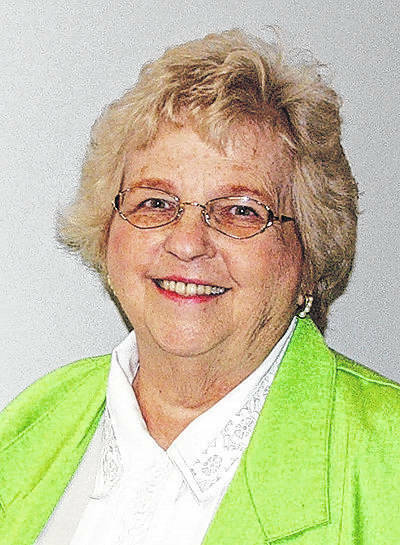 Joan Baxter is a historical columnist with this column sharaed by the Fairborn Daily Herald and Xenia Gazette of AIM Media Midwest.